Last Sunday after church, several boys guided us to the new deck area that is open at All In One Family, each grabbing a hand and pulling us along into this mostly unexplored space of new, vast views for these short fellas. They immediately ran to the railing, curious at what made them go there first out of all the spaces to consider, I followed them. Each looked back at me, enthusiastically pointing at something they wanted to show me. Chickens, motos, cars, people on bicycles, the roof across the street going on a new Sunday school space for the kids and the man high in a tree collecting mangos elicited several giggles. There were new views and new aspects of life. There were never before seen angles of the everyday life surrounding them. Consider the perspective of the kids…theirs is mostly ground level and, until this new space, hardly ever over the compound wall. They peek out the gate, sometimes ride in a car or bus, but never this bird’s eye view of their world. They can see far and wide. Instead of just seeing the moto drive by the front gate, they see it until it disappears down the long road. 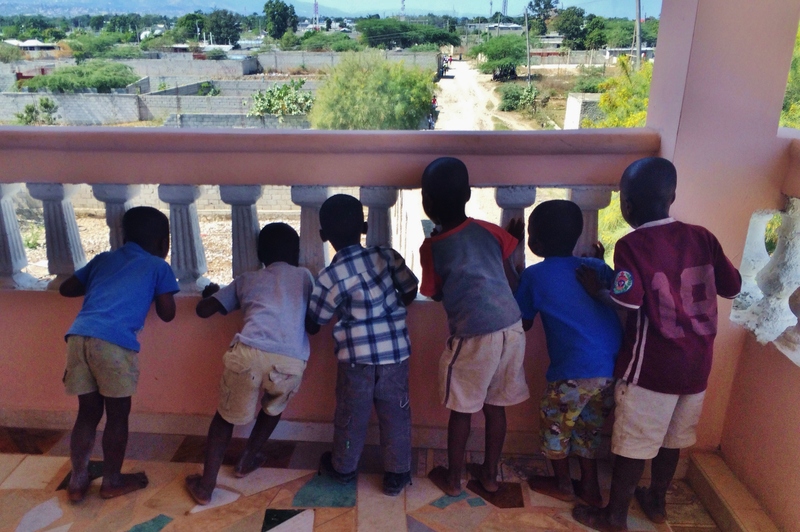 They can see out over the valley where Port-au-Price sits and all the way to where Petionville and Delmas can be seen climbing up the mountain. They can see the mountain ranges on both sides of the valley. Their entire worldview expands with just a few more steps carefully taken up to the third floor above their school classrooms. Imaginations ignite. Dreams get busted wide open. Perspectives are changed. All as we look out in the vast area surrounding our life. We have all had tunnel vision to a particular goal at some point in our lives. In a lot of areas tunnel vision is not only a healthy way to see, but very beneficial to the cause. There are a lot of churches going from a wide vast view of how to help in the world to a laser, tunnel vision viewpoint in the world. Going all in at one location and honing in on ministry there. I’m not starting that debate, because honestly I fall on both sides depending on how the Holy Spirit is leading a particular community. Following the Holy Spirit has never steered anyone to invest in a life that wasn’t meant to be invested in. But tunnel vision can be deceiving. Different perspectives can be ignored and missed by focusing so intently on the end goal. Tunnel vision can make us blind in so many different ways, especially when it is not a Holy Spirit led endeavor. But what if we allowed ourselves the space to engage the pureness and enthusiasm of seeing the vast, wide Kingdom that God is building? God’s Kingdom only knows tunnel vision to one thing, and that is seeing this world restored to its original creation. What if we allowed ourselves to look out at God’s Kingdom and see something new? What if enthusiasm for what we see was contagious to those around us? What if we asked God for the Spirit to lead our eyes to look at the world as he sees it? What if we really let ourselves look from an upper level view of God’s world? Where would God lead our eyes? What if we took a cue from the kids and experienced extreme excitement at taking it all in from the third story view? What would happen if we willingly sought out different perspectives in our daily lives that guide us to observe closely, pray intensely and move as the Spirit leads? What I do know is that enthusiasm is contagious, and contagious is what draws people deeper into God’s heart for this world. Deeper into God’s Kingdom. I want the sparkle in my eyes as I look out at the world around me. I want to point out things that I am excited to show others. I want to draw people into God’s perspective. I want to look at this world as the boys were looking at their world last Sunday. This entry was posted in Haiti, Lent 2015 and tagged 1word5voices, God, God's kingdom, Haiti, Holy Spirit, look, perspective, Rethink Church, tunnel vision. Bookmark the permalink.